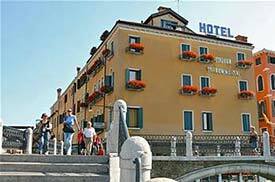 ABOVE: The Hotel Arlecchino is one footbridge away from airport buses, cruise-ship shuttles, land taxis, and the People Mover to the Marittima cruise port and the Tronchetto parking garage. INSET BELOW: The larger bridge will take you to Venice's main tourist sights. Location: Just off the Piazzale Roma, with only one small bridge to cross. The Hotel Arlecchino is just off the Piazzale Roma, across a pedestrian bridge. From the hotel, you can cross another small bridge and walk into Venice's historic center, or you can catch a No. 1 vaporetto water bus up the Grand Canal to the Piazza San Marco (or a No. 2 water bus to the San Basilio cruise pier). Unlike many hotels in Venice, the Arlecchino offers triples and quads in addition to the usual double rooms. The best rooms, if you like watching boat traffic, are the classic doubles with canal views. Free Wi-Fi is available throughout the hotel. The top satellite image shows the Piazzale Roma (lower left), the railroad station, and the sestieri of Santa Croce and San Polo in Venice's historic center, across the Grand Canal. The Hotel Arlecchino is near the bottom of the picture, to the right of the words "Fondamenta de la Burchielle." In the second photo, the Piazzale Roma is on the right. To reach the Hotel Arlecchino, you walk to the cross-shaped bridge to the left of the square, go to the top, and turn right. The hotel is the yellow building at the base of the bridge, with an arcaded walkway at ground level.